Enuresis can also lead to avoiding situations where your clients want to sleep over at a friend's house or going on holiday. It could be that they never actually learned how to sleep through the night without wetting the bed or the condition may have been triggered from a traumatic experience. Whatever the reason, this hypnosis script download can help by teaching your client's subconscious mind to recognize the signal that they need the bathroom - even in their deepest sleep. 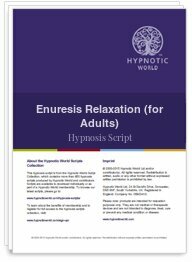 So, if bed wetting is a problem that your client would like to overcome then download this powerful hypnosis script today to enable them to enjoy waking up in a clean, dry bed every day.